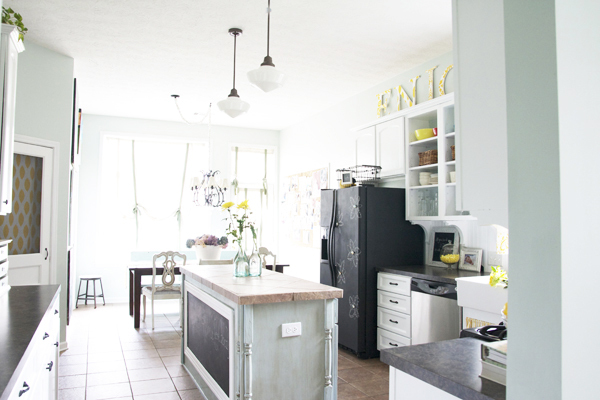 Before & After: Charming Kitchen with Painted White Cabinets! You know I love white kitchens with charming details, right? Well this one from Pure & Lovely (who just changed her blog to The Handmade Home) has so many charming details I have featured several parts of it already, including the adorable DIY screen door and the Chalkboard Fridge! Clearly I have a crush on this room. I’m obsessed, but can you blame me? When you paint kitchens white…wow!! Now it is time for the big reveal of the whole kitchen before & after! 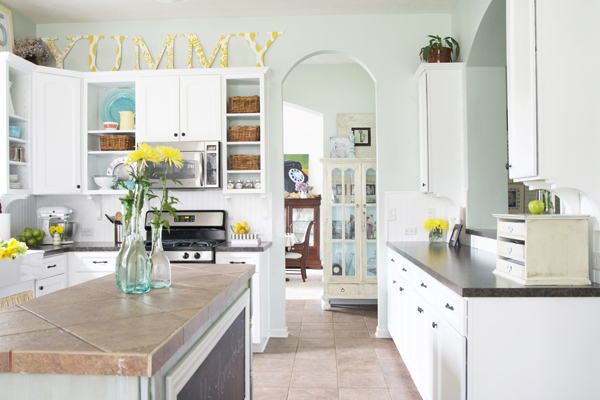 It went from dark cabinets to light and bright and airy white cabinets! And the yellow fabrics? Swoon. I’m in love. You will be too. You NEED to go see the before & after photos. Ahhh, so lovely.